One in 12 Canadians has a rare disease, but many people face challenges getting an accurate diagnosis and appropriate treatment. We appreciate the governments' announcement earlier this week for a working group to support people living with a rare disease in Ontario. This is a positive step towards improving the lives of people with rare diseases and their families. We are disappointed that a Private Member's Motion, #TreatRareDisease, was not supported. A Select Committee for Rare Disease Treatment Funding would have complimented and enhanced the government working group that was announced by the Minister of Health on Monday, February 29th, 2016 (see press release below). The Select Committee would have provided a transparent and accountable process to improve treatment and care for people with rare diseases. In the absence of a Select Committee on rare disease, we advocate for an open working group to achieve what would been possible through a Select Committee; starting with holding public hearings so people from across Ontario can contribute their knowledge and expertise. It is important for all of us that we don't stop and continue to move forward – we encourage you to reach out to your MPP to rally and keep the momentum thriving. "Ontario Can Take the Lead to Change the Lives of People with Rare Diseases"
TORONTO, Feb. 29, 2016 /CNW/ - Today, on International Rare Disease Day, the Canadian Organization for Rare Disorders (CORD) welcomes the announcement made by Ontario Health Minister Eric Hoskins to open a new clinic for patients with Ehlers-Danlos Syndrome (EDS), which could be expanded to other rare disorders, as well as his commitment to strike a working group to develop an Ontario approach to a coordinated provincial healthcare system for patients with rare disorders. Minister Hoskins mentioned his commitment to establish a rare disease working group, which will include patient leaders and clinicians, surrounded by patients and caregivers during a luncheon hosted today by CORD at Queen's Park. 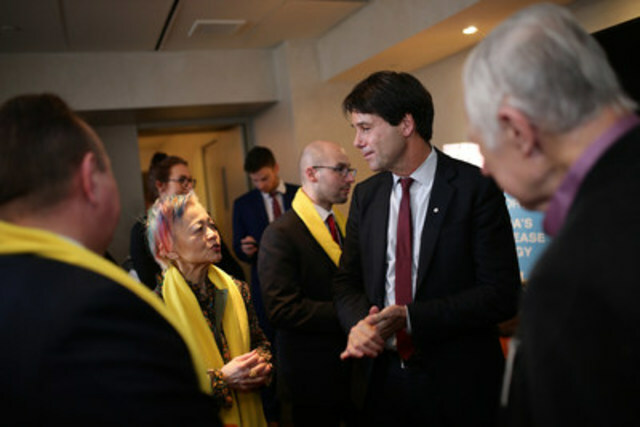 "Minister Hoskins' previous efforts on behalf of patients with urgent and underserved needs gives Ontario families with rare diseases great hope that his leadership and commitment will inspire other stakeholders and offer an example for other provinces" said Dr. Durhane Wong-Rieger, President and CEO of CORD. Patients who attended the luncheon at Queen's Park expressed optimism. Said Riyad Elbard, a Torontonian living with the blood disorder thalassemia said, "I have been fighting for change for 25 years and this feels like it could be the turning point in healthcare for rare disease in Ontario." Michael Eygenraam, a patient living with atypical hemolytical uremic syndrome (aHUS), expressed similar hope, stating that "as rare disease patients, we have individual needs but we also share a common commitment to a common good. With today's announcement, Ontario is sending a message to patients and their families that their needs are being recognized, and Ontario is inviting us to work together towards achievable and sustainable solutions. Now, let's get to work because we simply can't afford to wait any longer." Over the past year, CORD went on a cross-country tour with Canada's Rare Disease Strategy, which is widely supported by patients, caregivers, clinicians, researchers and industry representatives from coast to coast. Dr. Wong-Rieger added that "the Ontario working group announced today is a first step in implementing Canada's Rare Disease Strategy in the province, and we look forward to being a part of setting the mandate and agenda to assure tangible and timely progress on all five pillars of the Strategy, namely, diagnosis, care, community support, access to treatment and research". Based on extensive consultation, Canada's Rare Disease Strategy, announced last May, establishes five major goals: improving early detection and prevention; providing timely, equitable and evidence-informed care; enhancing community support; providing sustainable access to promising therapies; and promoting innovative research. For the complete plan, go to: www.raredisorders.ca/canadas-rare-disease-strategy/. Follow us on Twitter at #Canada4Rare.